Sandie Shaw thinks John Lennon should have married her. Beatles Radio: The Beatles, Solos, Covers, Birthdays, News The Fab 4 and More! Sandie Shaw believes John Lennon would still be alive if he had married her instead of Yoko Ono. The 71-year-old retired singer had a huge crush on the late Beatles legend - who was murdered on December 8, 1980 - from a young age. The two musicians would regularly cross paths during the swinging 60s in Britain but she was never able to progress their friendship to a romance, something she regrets. Sandie - who has two children with Virgin Group co-founder Nik Powell and daughter Gracie Banks with fashion designer Jeff Banks - told the Daily Mirror newspaper: "I loved John and thought he should have married me. He'd be alive today if I had, I would have protected him and taken a bullet for him!" The 'Puppet on a String' hitmaker - who is now married to third husband Tony Bedford - first met the 'I Am The Walrus' singer at a Beatles concert at The Royal Albert Hall by pretending to be his cousin. 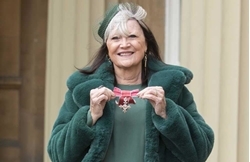 Sandie - who received an MBE this year - recalled: "The Beatles were performing at the Royal Albert Hall so I rang up, saying 'I'm Sandra, John's cousin. I haven't seen him in ages, so I will pop in'.